Our CNC manual Lathe Service can adapt to multiple different sized projects to perform cutting, sanding, knurling, drilling, and face turning. This machine brings high productivity to your medium to small sized projects swiftly and efficiently. Our high-rigidity, high precision CNC Lathe Service has extremely powerful turning and milling performance. This machine can perform both complex and simple applications making it extremely useful for a multitude of custom tooling projects. Max Turning Length: 28.6"/ 27.7"
Max Travel: (X) Axis 10.24", (Z) Axis 31.3"
Our Honing Service is a high precision process to improve accuracy, shape, and finish. With this process we can remove ruptured metal and extra stock and prepare your pre-machined work. We can provide an ideal finish for your project and accurately optimize most cylindrical surfaces to exact straightness, and diametric roundness. Max Bore Diameter: .060" to 1.500"
Max Bore Length: .125" to 18"
Our Cylindrical Grinding Service provides support to a variety of in-demand manufactured projects. 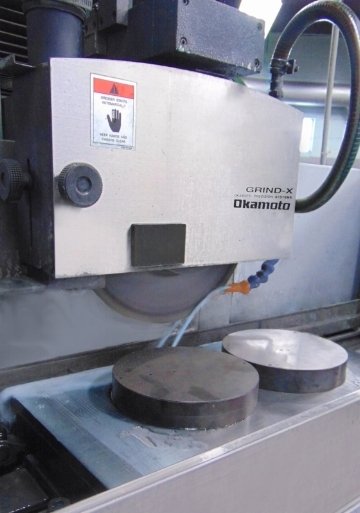 Our services provide accurate abrasive cutting application on the outside of a part or tool. Our machines are suitable for any industry that needs low volume small workpieces precisely ground. Our Jig Grinding Service can machine shapes and precision holes with the highest level of accuracy. Jig grinding can hold tolerances to the ten thousandths of an inch allowing hole and pin systems to seamlessly interact with each other. Our machining experts have experience with small and large components of both simple and complex designs needed for your project. Max Grinding Diameter: 3 1/2"
Distance Spindle to Column: 13 1/2"
Will Grind Holes: 5/16" to 3 1/2"
Table Travel: 11" x 18"
Our Surface Grinding Service is a process that can produce a very flat surfaces, accurate tolerances, even roughness, and also sharpen cutting tools. Our variety of abrasive grinding wheels ensure the right finish for your project on both metallic and nonmetallic materials. We even can grind carbide! We have both manual and automatic surface grinding machines allowing your project to get the right degree of attention with a high degree of dimensional accuracy. Our Milling Services provides a cost-effective solution for short run workpieces. We can hold a wide range of hardened shapes and sizes to tight tolerances. We have experience milling steel, aluminum, rubber, plastic, and various grades of tool steel. Our vertical machining center offers high speed production and precision milling, drilling, and tapping for efficient and convenient part creation. Table Size: 20.8" x 47"
Travels: (X) Axis 40", (Y) Axis 20", (Z) Axis 20"
Max Spindle Nose To Table: 27.8"
Our CAD/CAM Services or Computer-Aided Design and Computer-Aided Manufacturing Services can be a cost saving process from prototyping to final design solutions for 2D and 3D parts and tools. CAD/CAM can provide modeling for initial part design, part rework, and program manufacturing processes for CNC equipment. SpaceClaim enables us to do 3D modeling: AutoCAD is our main drafting software; Accurite software is used to program one of our vertical milling machines; Espirit SolidMill CAM software enables us to program our milling machines; OPTICAM Classic automates wire EDM programming; Alpha Plus 800S is used to program one of our lathe applications; DMG MORI Software Solutions powers our versatile and high precision lathe. Our Sinker EDM Service or Ram EDM Service can burn materials regardless of hardness, toughness, and odd-shaped features. Electrically conductive materials including brass, graphite, and copper are used to shape materials during this service. This service offers high precision cutting that are held to extremely close tolerances. Table Area: 15 1/2" x 23 1/2"
T-Slotted Ram Area: 6" x 12 1/2"
Our submerged Wire EDM Service offers high precision cutting of all shapes and sizes up to +/- .0001". We work with carbide, plastics, and a variety of tool steel. We work in many markets sectors including the automotive, mining, aerospace, hydraulic, and manufacturing industries. Max Workpiece Dimensions: 47.2" x 27.6" x 15.8"
Wire Diameters: .006" to .012"
Travels: (X) Axis 21.7", (Y) Axis 13.8", (Z) Axis 15.8"
Our Sawing Service offers precision metal cutting, sawing, and finishing to ensure the highest quality for your metalworking needs. Our machining expert focus in prototyping and short run sawing for production. Metals include steel, plastic, aluminum,and hardened tool steel. Max Work Height: 3/4"- 11"
Work Table Dimensions: 24 1/4" x 24 1/4"
Our high precision Laser Etching Service has the ability to mark on anodized aluminum, back-lit buttons, carbide, cast iron, ceramic, chrome, composites, hardened Steel, multi-coated metals, nickel, painted medal alloys, plastic, ploycarbonate, rubber, sliver, stainless steel, and titanium. This machine also has the ability to cut at a variety of depths from a shallow etch to a complete cut through, as well as, etch on curved surfaces. Our impact engraving technology allows us to etch onto stainless steel, acrylic, copper, titanium, gold, nickel, brass, iron, silver, and aluminum. This equipment runes at high speeds and has a precise diamond tipped stylus perfect for intricate deigns and small typography. We use it primarily for low volume highly customized printed orders on both flat and curved surfaces. This passion for creating and implementing manufacturing methods favorably positioned us for our entry into the personalized jewelry and the customized corporate gifts business through our subsidiary company, Expressed Impressions. With creativity, innovation and a "Customer-Centric" approach, Expressed Impressions in on a mission to provide its customers with premium, desirable, and made to order products. Customer by customer we are building a brand that is synonymous with personal style, quality and value. Our Additional Services are how we show extra "Sharp Care" or customer service for your parts and tools. We value your bottom line, That's why we package parts to ensure they are unquestionably protected for safe delivery. Depending on part size and requirement we offer dip seal coating, elastic mess sleeves, and specialized tubing to ensure the highest quality shipping and arrival of your parts.